How could they possibly make Codenames better? This guessing game by Vlaada Chvátil is already a modern classic. Add Disney characters and scenes to the cards, of course! 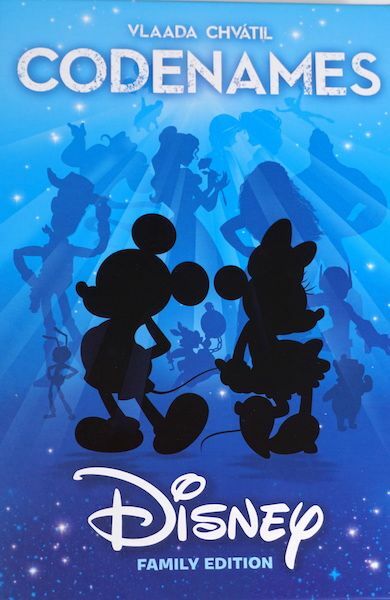 For 2-8 players (or more), ages 8 and up, Codenames: Disney Family Edition applies a Disney theme to the modern classic Codenames from Czech Games Edition. Did USAopoly strike gold like Scrooge McDuck, or is this game an Eeyore? For those who aren’t familiar with Codenames, it is a game where a clue-giver gives vague clues to get the rest of their team to guess certain cards (marked in either red or blue on the key card) while trying to avoid the rest of the cards. 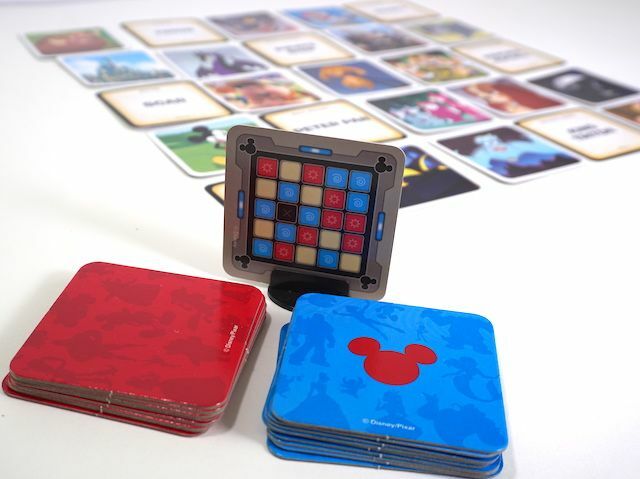 In Codenames:Disney, there are two ways to play. 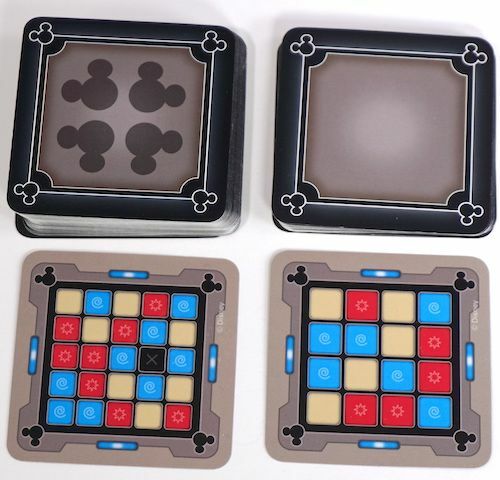 You may use the classic 5×5 grid with the assassin card (just called the “game over” card to keep it family friendly) or an easier 4×4 grid without the “game over” card. The clue-master gives a one-word clue and a number (indicating how many cards fit that clue). Their team tries to guess as many of those cards as they can, but any mistake will end their team’s turn. The team who covers all “their” cards first wins – or the team who picks the “game over” card loses. 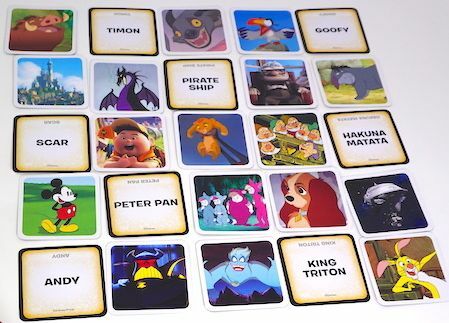 What makes Codenames: Disney different? The cards all have text on one side and pictures on the other, so even kids who can’t read can play. Clue-masters can strive to give clues that the whole family can understand – but be careful, proper nouns such as “Pixar” are not allowed! USAopoly has done a fantastic job making this version approachable and easy to understand. They’ve tweaked the Codenames formula to make it incredibly family-friendly. Obviously, everything in this game is Disney themed, and covers 100 years of Disney cartoons, from Bambi to Moana. Special note: If you own another version of Codenames, you may combine the games together for more fun! Just decide which grid count you will use (4×4 or 5×5), and whether you are going to use pictures, words, or both. 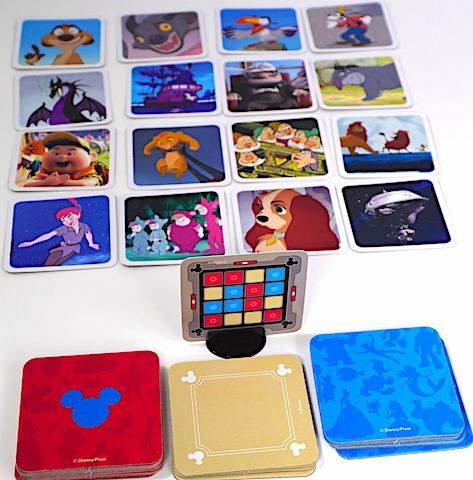 We really enjoy Codenames: Disney Family Edition and recommend it for any family that likes games and Disney. The Family Gamers received a copy of Codenames: Disney Family Edition from USAopoly for this review.